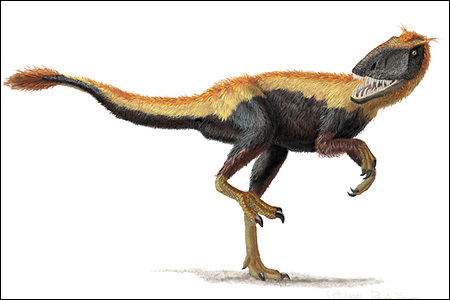 This week, two articles were published that discussed feathers in two different dinosaurs. We’ll start with the cooler one…. uhhhh… I mean…. the…. one with better preservation. Yes, that’s it! The first [article] described a bird fossil in amber, the third one from Myanmar that has been recently described. It is of an enantiornithine, an extinct lineage of toothed birds from the Cretaceous, and it’s spectacular. Most of the animal is preserved because it’s trapped in amber and many of the feathers are preserved in detail. 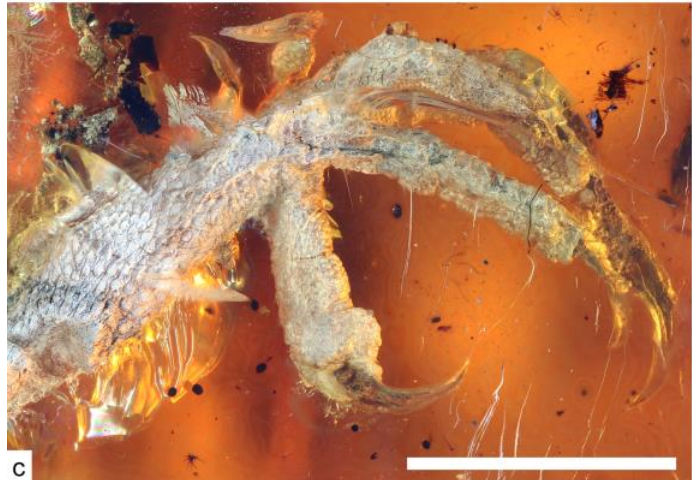 Figure 6c from the paper showing the 99 million year old enantiornithine foot in amber. Behold its beauty! Scale bar is 5 millimeters. The authors wrote a thorough report of each part of the specimen, along with descriptions of the feathers found on each portion of the body. By CT scanning and examining it under dissecting microscopes, the authors were able to see both bone and feather morphologies. The morphologies indicated that the specimen was a juvenile. The feathers show that enantiornithines were precocial at hatching. Precocial means that they were able to walk around, and potentially even fly, from the day they hatched (like a chicken or a brush-turkey). Baby birds that need a lot of care before they can manage by themselves are altricial. This new specimen, along with other enantiornithines, are pointing to most enantiornithines being precocial. They are also known to be mostly arboreal (tree-dwellers). The combination of precocial and arboreal is not something that modern birds are doing: the precocial birds of today are ground-dwellers and the altricial birds of today are tree-dwellers. This means that enantiornithines were superficially similar to modern birds, but living different sorts of lifestyles than what we see today and this could have impacted the places they could live in and the body-shapes they had. 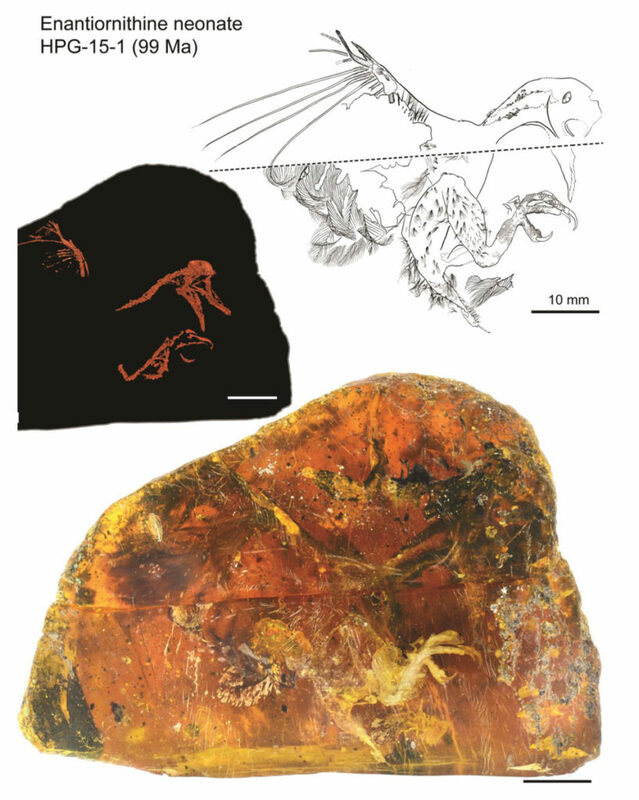 The graphical abstract from the paper showing the amber chunk with the fossil (bottom), the CT scan (middle), and a line drawing interpretation (top). The second [article] was about tyrannosaurids. This group contains Tyrannosaurus rex, Gorgosaurus, Tarbosaurus, and a few other large-bodied theropods that are known for their large heads and tiny arms. There has been an ongoing debate on whether or not they had feathers covering their bodies. This debate originated because we know feathers were present on a lot of other theropods, including on the most basal members of the group, like Dilong. The issue is that we’ve never found a larger bodied tyrannosaur with feathers preserved on it. An illustration of Dilong by P. Sloan. To address this question, the authors examined fossilized skin impressions of several specimens of this group. They found that scales covered parts of the neck, abdomen, hips, and tail and concluded that most of these large-bodied tyrannosaurids were covered in scales. If feathers were present, they would have been limited to the back of the animal. There are many hypotheses (testable scientific ideas) out there about why these big tyrannosaurids lost their feathers, but I’m not going to address those here. 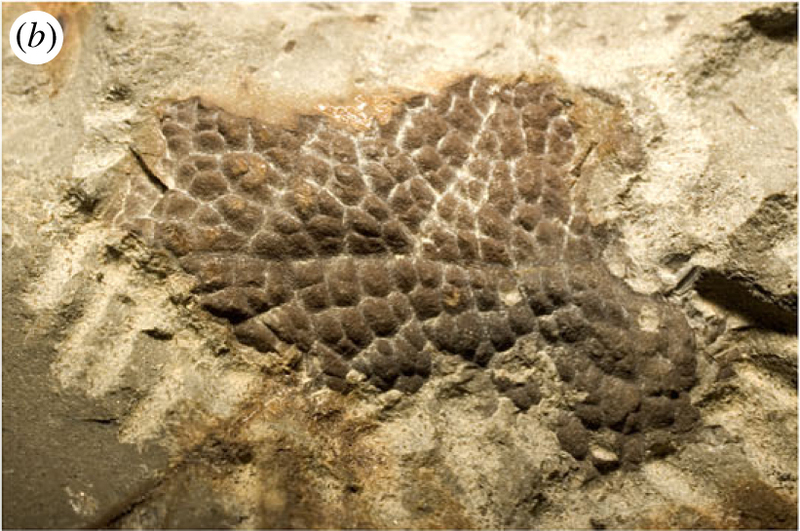 Figure 1b from the article showing a piece of fossilized skin from T.rex. You can see the outline of each scale. The main point I want to make about this paper, and I’m going to quote my undergraduate mentor (Dr. Tom Holtz) here, the absence of evidence is not evidence of absence. That means just because we haven’t found feathers preserved on big tyrannosaurids, does not mean they didn’t have them. The conditions needed for feather preservation are very specific, and the places where we find these big tyrannosaurids are not the same types of places that preserve feathers. So maybe T. rex had feathers and they just weren’t preserved. Maybe T.rex didn’t have any feathers. Maybe it had feathers as a baby and lost them as an adult. Maybe it had feathers in some places on its body. For now, we don’t really know. We might never know. And that’s ok because science is a process of continuous discovery and interpretation. We’ll just have to keep digging.